Snapshot 2018 is ISCA’s latest annual release of key facts and statistics about the Independent school sector. 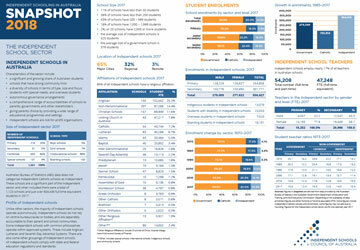 Now in its 14th year of publication, the ISCA Snapshot is a well-regarded and highly valued resource, with facts and figures compiled from rigorous analysis of a range of Government data sources. Independent schools are not-for-profit organisations. Australian Bureau of Statistics (ABS) data does not categorise independent Catholic schools as Independent. These schools are a significant part of the Independent sector and when included there were a total of 1,123 schools and just over 604,436 full-time equivalent students in 2017. Unlike other sectors, the majority of Independent schools operate autonomously. Independent schools do not rely on central bureaucracies or bodies, and are separately accountable to their parent and school communities. Some Independent schools with common philosophies operate within approved systems. These include Anglican, Lutheran and Seventh Day Adventist Systems. There are also some other groupings of Independent schools. All Independent schools comply with state and federal education regulations and standards. 85% of all Independent schools have a religious affiliation. **’Other’ includes special schools, international schools, Indigenous schools, and community schools. Independent schools employ nearly 17% of all teachers in Australian schools. Sources: Figures in Snapshot are derived from data provided by the Australian Bureau of Statistics, the Australian Government Department of Education and Training, and the Productivity Commission. Depending on the availability of data, enrolment figures are either full-time or full-time equivalent (FTE). Some figures include independent Catholic schools and enrolments. Some figures may not add due to rounding. Figures for the Independent school sector are for the calendar year 2017. The proportions of private/government funding vary greatly from school to school. Estimated recurrent savings to governments from the Independent school sector: $4.6 billion p.a. Responsibility for the public funding of schools is shared by the Australian Government and state and territory governments. State and territory governments are the main public funding source for government schools. The Australian Government is the main public funding source for non-government schools, providing 75% of total government recurrent funding for Independent schools while states and territories provide 25%. The amount of funding received from all government sources varies significantly depending on the circumstances of the school. In 2017 the Australian Government announced changes to the ‘Gonski’ funding model which had been in place since 2014. The new funding model aims to transition all schools to a set share of Commonwealth funding. For government schools, the Commonwealth share is 20% of their SRS entitlement and for non-government schools the Commonwealth share is 80% of their SRS entitlement. Schools and systems below their set share will transition up over six years and those above their set share will transition down over ten years. New schools go straight on to their calculated SRS funding entitlement. The core components of the SRS funding model remain largely unchanged, comprising base funding plus loadings to address educational disadvantage. The per-student component is based on the Schooling Resource Standard (SRS) which aims to measure the cost of effective and efficient provision of education. Once fully implemented, loadings will be fully publicly funded. One feature of the funding model which only affects non-government schools is ‘capacity to contribute’ (CTC). This means that the amount of base funding schools receive is dependent on a school community’s estimated capacity to pay fees, as determined by the school’s Socio-Economic Status (SES) score. Schools with a higher SES score receive less per capita base funding. The SES methodology is being reviewed in 2018 by the National School Resourcing Board. From 2014 – 2017 the capacity to contribute settings for schools in the SES score range of 108 to 122 had a higher primary per student allocation than the secondary per student allocation. From 2018, the primary line has been adjusted so that while it is still curved, at no point will a primary student attract a higher per capita base amount than a secondary student attending a school with the same SES score. In addition to setting the Australian Government share of SRS for all schools, the legislation now also places requirements on state and territory governments in relation to school funding. State and territory governments are required to fund government schools to at least 75 – 80% of their SRS and to fund non-government schools to at least 15 – 20% of their SRS, at the sector level. The specific settings for each state and territory will be subject to bilateral agreements between the states and territories and the Australian Government. On average, parents and donors in Independent school communities in 2016 contributed 89% of funds for capital developments, such as school buildings, grounds and equipment. Independent committees called Block Grant Authorities in each state and territory administer capital grants for non-government schools on behalf of the Australian Government. In 2017 it is estimated that grants for the Independent sector totalled approximately $55 million. In the Independent sector Australian Government capital grants are distributed on a needs basis, with priority given to disadvantaged school communities with the least capacity to raise funds. In Queensland some capital grants for Independent schools are provided by the state government. Several state and territory governments also provide interest subsidy arrangements. Note: Funding figures in Snapshot use the latest available data which is for the financial year 2015-16, or for the calendar year 2016. SNAPSHOT 2018 is also available as a printable A4 PDF. It is also available as an A5 booklet which can be ordered by contacting ISCA.